The horizontal wind vector, vH, is represented by the bold black line in the diagram below; i and j represent unit vectors towards East and North, respectively. Equations for converting horizontal wind vector information between the different notation conventions are given at the bottom of this page. u is the ZONAL VELOCITY, i.e. the component of the horizontal wind TOWARDS EAST. v is the MERIDIONAL VELOCITY, i.e. the component of the horizontal wind TOWARDS NORTH. (the symbol w is used for the VERTICAL VELOCITY, which is typically +ve for an upward velocity). φVECT is the WIND VECTOR AZIMUTH, i.e. the direction TOWARDS which the wind is blowing. It increases clockwise from North when viewed from above. Terms such as northward, eastward etc. imply wind vector azimuths. φMET is the METEOROLOGICAL WIND DIRECTION, i.e. the direction FROM which the wind is blowing. It also increases clockwise from North when viewed from above. Terms such as northerly, easterly etc. imply meteorological wind directions. 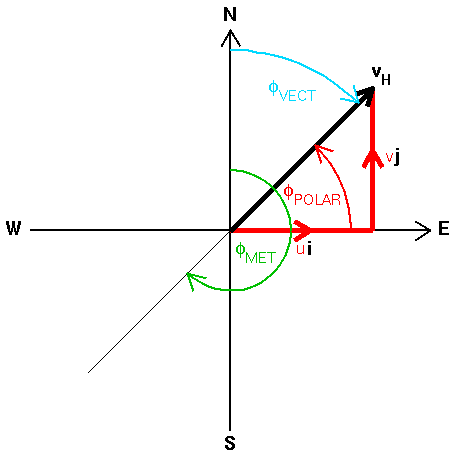 φPOLAR which is the WIND VECTOR POLAR ANGLE in two-dimensions. It increases ANTICLOCKWISE FROM the +ve x-axis, i.e. from EAST; this in the opposite sense to the wind vector azimuth and the meteorological wind direction, and from a different origin. When converting back from orthogonal components to speed and direction, the atan2(y,x) function should be used in order to avoid ambiguity in the returned value of the wind vector polar angle. The expressions below can be used to convert horizontal wind vector information directly between the orthogonal component and speed/direction conventions without the need for first converting directions between wind the vector polar angle and the wind vector azimuth or meteorological wind direction.